Oh, that distinct smell of a pile of shoes. You know what I am talking about. Leather, rubber, laces, all mingled together. I am very intimate with that smell. Deep, inhaling breath through the nose. Ah, that’s it. Always brings me back to my childhood. Now why on Earth would it do that, you ask? Well you see, I grew up in a moderate-sized house with 13 people. Thirteen people in the house meant you were never alone. Also I am very introverted. Never alone and introverted is a bad combination. Now I didn’t know I was introverted when I was little. I presume no one else ever got quite got that either. But not knowing the name of my condition didn’t make me less aware of it. That’s where the shoes come in. We had a closet in the house that stored miscellaneous house things, like sheets, blankets, some old coats. And shoes. 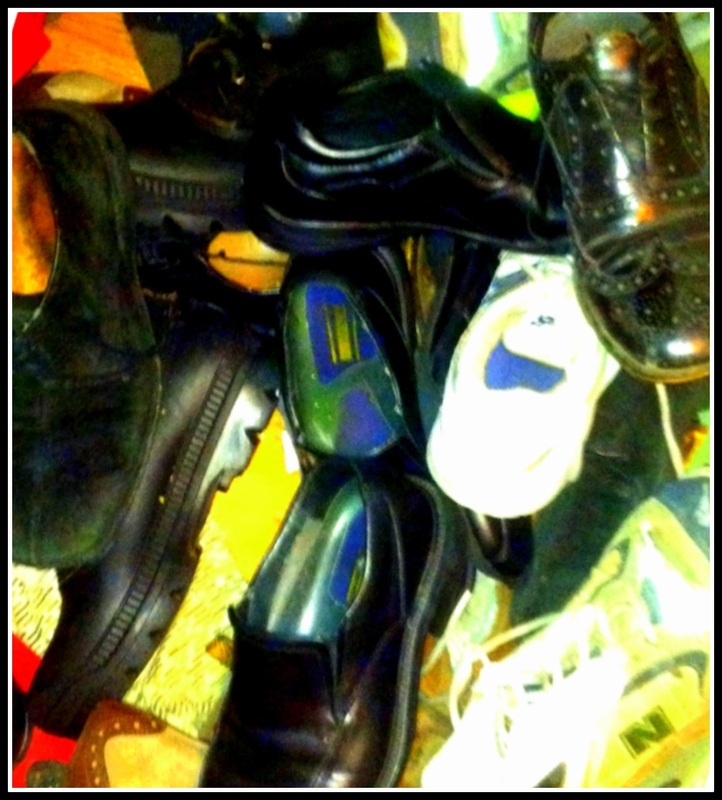 Shoes no longer worn on any regular basis but in too good of shape to just be thrown out. They were all thrown in a jumble on the floor of the closet. Another thing about me. I was the runt of the family. Very small. I could fit places others couldn’t. So into the closet on top of the shoes I went and closed the door. Ah, freedom. The freedom of being alone. Of it being quiet and peaceful. And the smells of shoes. Leather, rubber, laces. Not the first place I would have looked for nostalgic connections. Reminds me of the time I couldn’t find my one pair of shoes. I looked for hours and then gave it up. Who needed shoes? It took several days before I told Mom I couldn’t find them. No recollection if we ever found them. Of course sometimes too many people would be mulling about and if they saw me crawl into the shoe closet I would be pestered. So the alternate refuge was behind the furnace in the basement next to the water heater. It was pretty ideal. In the winter it was warm. In the summer it was cool. No one accidentally walked by. Sometimes I would hear people looking for me. But I wouldn’t come out. Not until I was ready. And even today. Sometimes I am ready and sometimes I am not. I’m just no longer hiding in the shoe closet. This entry was posted in Freedom, Personality and tagged alone, closet, introvert, large family, nostalgia, shoeless, shoes, smells. Bookmark the permalink.